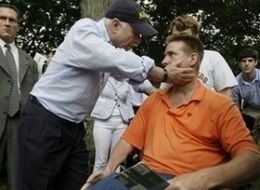 JedReport's Latest Devastating Video: "McCain's Neverending War"
Fred Mizell died on July 4th and is dearly missed by many. While most of our three plus weeks in Glendora were sad and trying we did manage to have a few magic moments. First my heart is so full of gratitude for knowing Dad Fred and watching the bond between Phil and his dad all these years. How they would yak and laugh and laugh regularly over the phone, we traveled thousands of miles together on motorcycles and shared lots of time.. He had twenty years in retirement, played hard, shared an amazing neighborhood community, loved his Operating Engineer family, embrace all of our family and enjoy life with a twinkle in his eye, knowing all that brings great comfort. He had his beloved second family Gina, Tim, Riley and Dylan all nearby too. I want to share a story with you too. Here is what happened: it may be called magic, 'it', god, life, meditation, kindness, whoo whoo, a miracle whatever...for me just call it comfort. Monday night we had an amazing Memorial Service for Fred. Many gathered in a cozy chapel full of flowers and light. Phil's brother Warren did a welcoming prayer ... Then Warren called us out to share stories and glimpses of Fred's life. Many spoke funny, kind, heart felt words of their time with Dad Fred. It was a magic time full of love. We all left cloaked in his love with memories of his many gifts ( berries, avocado's, homemade pies, fruitcake etc...) as well as lots of stories of good deeds. "The man who could fix anything". Tuesday was a traditional funeral, with Brenda, Gina, and Tim adding heart full words of love. Last we moved out to the rolling hills of the memorial gardens where he was laid to rest next to Gena'a mom Empress who passed away five years ago. It was beautiful there and as we left a beautiful majestic hawk swooped down right over Fred's resting place, gliding on out of sight around the rolling hillside. I was in awe as the hawk seemed to tip his wing in welcome. Later after doing errands I arrived back at Dad Fred's house and two more hawks circled high above. Phil & I stayed in Dad Fred's room. That same night, at midnight, the alarm by the bed went off out of the blue. Phil said 'I wonder if it means anything, I can't think of anything'... so odd that it would go off the day he was buried. Never during the weeks before or after. Wrapped in the comfort and love of knowing him... I wish him well. He always seemed happy in life...carrying a simple elegance of accepting things as they were and making the best of it. He is missed and I can only hope we will meet again. Phil's dad Fred (81) passed away on Friday July 4th. He lived a long. full, rich life. Five children, along with lots of grandkids, and friends from around the country held him close to their hearts. He had a traveling spirit, a motorcycle heart, and a 'MacGyver' spirit (can fix anything, anywhere, anyhow). He loved his family, his dogs Precious and Muffin, and hanging out with friends and loved ones. There is so much to celebrate woven in the saddest of time. Before we headed south I had been working on improving some designs at Cafe Press. See what you think! Pneumonia - Last Tuesday we got 'the call'. Phil's dad was in a critical care unit down near Los Angeles. About two hours later we were in our car heading south. Fred is 82. Two weeks ago he was riding motorcycles and walking two miles a day. It's been a touch week for him in ICU however things are finally looking up. We are all anxiously waiting for him to be respirator free. Please keep him in your heart.